Taps and Dolls "A Tavern with a Twist" is like a neighborhood tavern stuck in the heart of downtown Indianapolis. 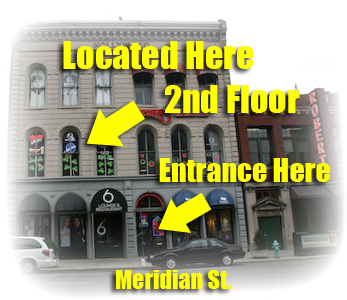 Located above 6 Lounge on Meridian St. Taps and Dolls offers 50 Beer Taps, Flat Screen TV's, Pool tables, Dart Board, Golden tee, Silverstrike Bowling, Big Buck Safari, JukeBox, Great Pizza!, and of course “The Dolls!”. All Request DJ, Dance Floor, Light Show Thursday thru Saturday. Taps and Dolls was opened in 2009 and is quickly becoming one of Indy's best hot spots. Open 7 days a week 6:00pm to 3:00am it is the best place to watch a sporting event, grab some killer pizza, or just enjoy some drinks with your friends. Taps and Dolls offers 50 Beer taps with 44 different beers and a full bar! This tavern has it all! Whether you are just wanting to relax and shoot a game of pool with a friend, cheers some beers with buddies, or you want to party the night away on our dance floor. Taps and Dolls is the place for any occasion. Drink Specials - 7 Days a week Click Here! Soon To Be Famous Pizza!